A family vacation is essential to bonding and building memories that last a lifetime, but vacations can be really hard to squeeze into the family budget. Every family wants to take their kids to Disney World at least once, but that’s a seriously expensive bucket list item to check off! While you’re saving for that, why not do a no-frills vacation that, instead of sensory overload, provides the family with some foundational grounding. A few days of clearing your heads, getting dirty and experiencing the calming relaxation of nature. Combat depression. Depression is the result of anxiety festering. It saps the joy out of life and makes looking forward to the next day nearly impossible. It is also on the rise in adults and children today. Replacing the darkness of depression with sunshine, fresh air, woods and water will turn around this unhealthy mind state. Family bonding: Whether you have a traditional family or a single parent, healthy family bonds today have become a struggle as we are pulled in many different directions daily. Setting up tents, hiking through the woods, basking together in the sun by the side of the river and sitting around a camp fire at night slow things down and quiets the mind to allow for true, deep relationship-building. Physical fitness: Lack of couches and electronics mean walking, biking, swimming and exploring as a means of entertainment. Eat really good food: Nothing tastes better than simple, all-natural food prepared over a fire or grill while camping. 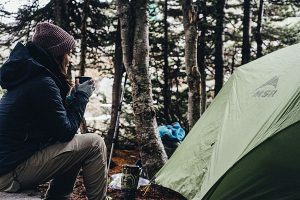 While eating is so often a simple form of pleasure at home, we typically wait until we are famished to eat when camping as food isn’t as accessible and we’re having too much fun to worry about it. The result is a very pleasant memory regarding these natural, healthy meals. Learning and gaining confidence: Getting acquainted with the outdoors at this level makes children less afraid of natural environments. It will trigger their curiosity and make them explore and feel more masterful in their place on planet Earth. Camping will be as expensive or inexpensive as you make it. It’s not for everyone. If members of your family refuse to let go of their anxieties of assimilating to the outdoors, it could be a horrible experience. But, if there’s a healthy sense of curiosity and excitement within your pack, you can make this a wonderful annual or semi-annual affordable vacation. 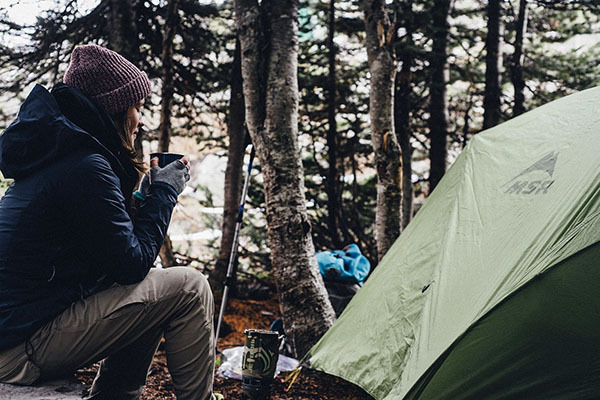 RULE #1, Borrow everything you can: Newbies should borrow all the camping gear possible to make sure this is an activity they will continue to pursue before laying out the cash for permanent gear. Research your potential camp grounds: Google “best camp grounds in (your state or neighboring state)”. You will find places that offer the amenities that you prefer at varying price points. Choose wisely. You may want to start by previewing Google Images first. Keep your destination within a half-day drive: Prepare the night before and leave early the next morning. Don’t lose two precious days of vacation (both there and back) by opting to drive too far. Your kid(s) will be less cranky as well. Pack all the food you’ll need: You’ll save big bucks by being self-sufficient with your food. You can always buy galloon jugs of water at area gas stations. If you haven’t been camping before, you’ll likely forget one huge essential – bug spray. Back in my day, we sprayed ourselves with a toxic compound that repelled mosquitoes and most humans as well, but there are many natural repellants today to choose from. I also recommend bringing toilet paper. The soft cushiness that you’re used to may be a welcome relief to the wax paper runner up that some grounds provide. Another modern convenience that I can’t do without is an air mattress. As far as I’m concerned, it turns a tent into a home. Things most people will remember, but I’ll mention just in case: SUNSCREEN. Good gravy, don’t forget sun screen. Likewise for a can opener. Flashlights with batteries. In fact, I have a really cool flashlight that you wind up (no batteries). My mother took my brother and I, and often a couple friends, camping many summers throughout our youth. We stayed in a big tent next to our camp fire each night and played at the lake’s beach or went hiking, fishing or canoeing each day. 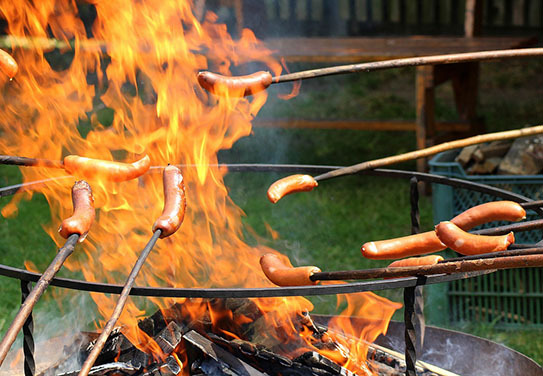 I don’t know which provided the best memories – our daytime activities or evenings around the camp fire. But, I can say that it did shape us in very positive ways. The feeling of belonging with nature is one of our most essential cures for depression and anxiety. 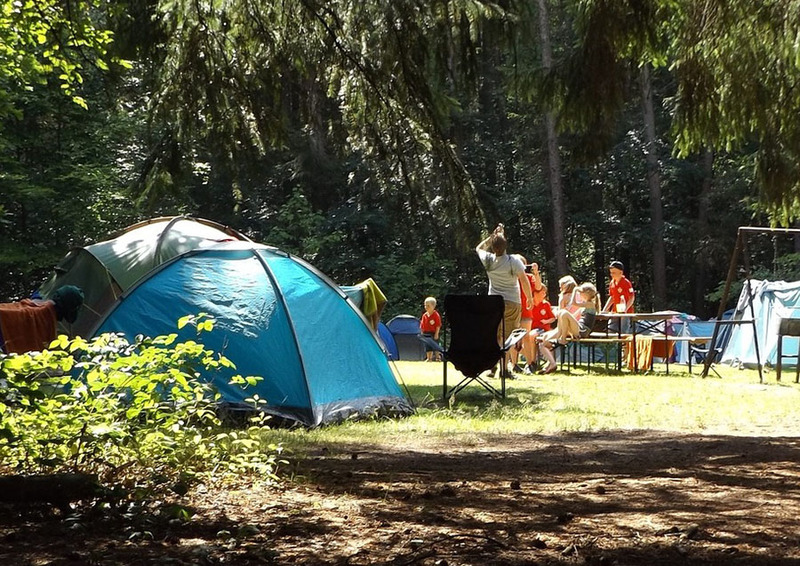 If you initiate your kids early enough, I’m sure camping will have a similar effect with your family. The older I get, the more I realize the old sayings in life are really true. In this case I’m referring to, “The best things in life are free (or, at least cheap)”.